Hristo Dunev. Mahaliah Edwards. Eleanor Chapman. Alice Cheer. 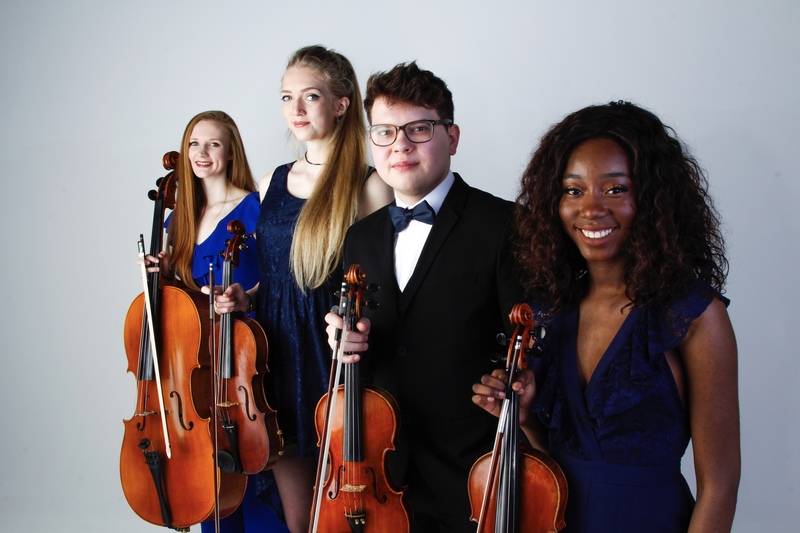 We are the Dunev Quartet, a string quartet formed in October 2017 at the Royal Birmingham Conservatoire. Although we were “put” together by the head of chamber music, from early on, it was clear that as musicians, we were completely on the same wavelength. All four of us immediately shared interest and excitement to play great chamber music and share it. What’s great is that individually, we all have quite different personalities which somehow manage to compliment each other. The unique situation of a string quartet is that it we spend a LOT of time together practising and then scheduling rehearsals as well as general planning and strategising and so we have become very close colleagues. Hristo – our very talented first violinist from Bulgaria. He has won a plethora of awards and is an avid photographer. Me – I’m the second violinist of the quartet and…well if want to know more about me you can read my about me page on my blog! Eleanor – is the viola player of the quartet. She’s from Lancashire, she’s a fab musician and also has the best fashion sense. Alice – is from Cardiff and is without doubt the most organised student in the country. She keeps us all in check! Since our formation, we have been fortunate to have regular coaching with Rose Redgrave and Robin Ireland. In addition, we have received coaching from Sini Simonen and Christopher Roberts of the Castalian Quartet; Jana Kuss and William Coleman of the Kuss Quartet, Oliver Heath and Krysia Osostowicz. Our current repertoire consists of Beethoven’s quartet no.10 op.74 aka “The Harp” and Haydn’s op.20 no. 5. Soon to come is Shostakovich’s 8th quartet. Past performances include November 2017 in the Recital hall at the Royal Birmingham Conservatoire, January 2018 at the Birmingham Central Library. Upcoming events include a performance of Beethoven op.18 No.5 in the Beethoven Marathon June 12th at the Royal Birmingham and Sunday Classics at the Spotted Dog on June 17th.